Current flood management, including flood control structures, land use regulations, and insurance markets, is adapted to historic flood risks, often using data from the past 100 years. In places where climate change will increase the flood risk outside the historic exposure, current management practices may not be adequate and losses could become increasingly catastrophic. For planning purposes, communities require scenarios of likely future flood inundation, which requires modeling the combined effects of sea level rise and changing peak flows along the relevant rivers, which in turn are derived from climate models and downscaling methods. In many regions, including the western United States, extreme precipitation is projected to increase with climate change, and these changes would have substantial impacts on flood risk. Simulating the effects of climate change on extreme precipitation presents substantial modeling challenges due to the complex weather dynamics of these events. Downscaling methods are critical to adequately incorporate the effects of climate change on extreme events and to simulate the response of local flood risk to these changes at the spatial and temporal scales most relevant to assessing community-scale risks from flooding. Statistical and dynamical downscaling is discussed and the implications of these methods for flood risk projections is evaluated. A case study is presented that illustrates three primary pathways for climate change impacts on a flood plain (sea level rise, reduced snowpack and higher intensity precipitation extremes) and illustrates the importance of methodological choices. 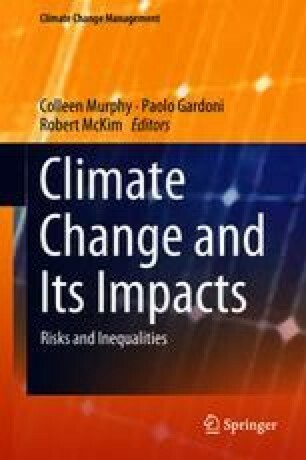 Research reported in this chapter has been supported by the Department of Homeland Security through the Critical Infrastructure Resilience Institute (CIRI) and by The Nature Conservancy (TNC). We thank Kris Johnson at TNC for developing the original idea for the Snohomish inundation study. We would also like to thank Ray Walton and Sarah Bengston at WEST consultants for their work developing and post-processing the hydraulic model output.